Washington, DC - On March 26, Congresswoman Barbara Lee (D-CA) introduced a resolution in the House of Representatives honoring the Oakland officers brutally killed in California on March 21. The resolution is one "Honoring the lives, and mourning the loss, of Sergeant Mark Dunakin, Sergeant Ervin Romans, Sergeant Daniel Sakai, and Officer John Hege, members of the Oakland Police Department in California who were brutally slain in the line of duty." Rep. Lee introduced the resolution with a number of her colleagues, including House Speaker Nancy Pelosi (D-CA), Reps. Jerry McNerney (D-CA), Ellen Tauscher (D-CA), George Miller (D-CA), Lynn Woolsey (D-CA), Zoe Lofgren (D-CA), and Pete Stark (D-CA). In a statement released by Rep. Lee, she said, "As we prepare to come together tomorrow as a community to pay tribute to four fallen heroes - Sergeant Mark Dunakin, Sergeant Ervin Romans, Sergeant Daniel Sakai and Officer John Hege - members of the Oakland Police Department, who were brutally gunned down while serving in the line of duty, a number of my colleagues joined me today in introducing this resolution honoring their lives and service to the City of Oakland, the entire Bay Area and this nation. "Often members of law enforcement go unnoticed, but they provide a critical service– to help protect our communities. These men performed their jobs to the fullest everyday knowing that there was a possibility that they would ultimately give their lives in service to their community. This resolution not only mourns their loss, but acknowledges the sacrifices they made to protect the people of Oakland. "I again extend my deepest sympathies to the family members of the four officers. This is a difficult time for members of the Oakland Police Department, and my heart goes out to the members who must deal with the loss of their brothers. Our prayers are with you during this solemn time." Honoring the lives, and mourning the loss, of Sergeant Mark Dunakin, Sergeant Ervin Romans, Sergeant Daniel Sakai, and Officer John Hege, members of the Oakland Police Department in California who were brutally slain in the line of duty. Now, therefore, be it Resolved, That the House of Representatives extends its condolences to the families and loved ones of Oakland Police Department Sergeant Mark Dunakin, Sergeant Ervin Romans, Sergeant Daniel Sakai, and Officer John Hege and stands in solidarity with the people of Oakland, California, their neighbors in the East Bay, and entire Bay Area community, as they celebrate the lives, and mourn the loss, of these 4 remarkable and selfless heroes who represented the best of their community and the future the people of Oakland are determined to create for their children, grandchildren, and generations to come. Officer John Hege, 41, one of four officers gunned down by 26 year-old parolee Lovelle Mixon in Oakland, Calif., was taken off life support around 2 a.m. today. His body was kept on life support to allow doctors to remove organs for donation. Officer Hege is the last of the four officers to die at the hands of Mixon. Officer Hege and partner Sgt. Mark Dunakin, 40, were shot at when they pulled Mixon over in a traffic stop on Saturday. A search for Mixon ensued, resulting in the deaths of Sgt. Ervin Romans, 43, and Sgt. Daniel Sakai, 35, when the city's SWAT team stormed an apartment where the suspect was hiding. The Oakland City Council and Oakland Mayor Ron Dellums will hold a vigil at 6 p.m. today at 74th Avenue and MacArthur Boulevard, near where the officers pulled over Mixon. Originally published in officer.com; reprinted with permission here. The news of four Oakland police officers being killed sends a chill down the backs of all of us who work in the criminal justice system, and the reverberating effects of this horrible tragedy is felt across the nation. Police officers everywhere make daily sacrifices to protect communities and maintain public safety - they work very long hours, spend significant time away from their families, and are constantly facing inherent dangers that accompany the work that they do. Well trained and adequately armed, they are exposed to more violent criminals on the street and ones who have increasingly more fire power with assault weapons and no hesitation to use them. Anyone in the field understands how dangerous a traffic stop can be, and it can be deadly as proven in the case of the Oakland tragedy. The shooting deaths of Oakland Police Sgt. Mark Dunakin, Officer John Hege, Sgt. Ervin Romans and Sgt. Daniel Sakai is a monumental loss and substantiates a well known fact that police officers, in their steady pursuit to minimize or prevent victimization - can, themselves, become crime victims. The cold-blooded killing of these dedicated officers leaves even the most street savvy and experienced law enforcement professional speechless, profoundly grief-stricken, and utterly devastated. In everyone's mind, the nagging thought persists, "It could have happened here; it could have happened to us, it could have happened to me." Oakland is not alone in its grief. The effects of their pain are felt throughout the nation, and many share their sorrow. At times like this, we pause to reflect upon our own lives, our friends and colleagues in law enforcement, and realize the good things in our own lives that should never be taken for granted. Perhaps an event like this reminds us to pick up the phone and call a colleague, have a belated celebration with a friend, or simply extend a helping hand to someone we care about. The impact of the Oakland tragedy is deep and enduring. Though everyone tries to remain strong for the families, colleagues, and friends of the primary victims, the secondary victimization penetrates us all. It brings home the fact that none of us are immune from deadly consequences for our well intentioned efforts and dedication to public safety. Karen L. Bune is employed as a Victim Specialist in the Domestic Violence Unit of the State's Attorney's Office for Prince George's County, Maryland. She serves as an Adjunct Professor in the Department of Criminal Justice at George Mason University in Fairfax, Virginia, and Marymount University in Arlington, Virginia, where she teaches victimology. Ms. Bune is a consultant for the Training and Technical Assistance Center for the Office for Victims of Crime and the Office of Juvenile Justice and Delinquency Prevention, U.S. Department of Justice. She is a nationally recognized speaker and trainer on victim issues. Ms. Bune is Board Certified in Traumatic Stress and Domestic Violence, and she is a Fellow of The Academy of Experts in Traumatic Stress and the National Center for Crisis Management. Even as the number of law enforcement officers killed by gunfire in the United States reached a 52-year low last year, Saturday’s violence in Oakland, CA, illustrates the enormous and unpredictable dangers that officers continue to face from heavily armed criminals who won’t hesitate to fire on officers—in this instance, not once but twice. Three Oakland police sergeants were shot and killed, and a fourth officer gravely injured, during two related incidents involving the same gunman. Together, the shootings are among the deadliest attacks on law enforcement in California history. At about 1:15 pm on March 21, Sergeant Mark Dunakin, 40, and Officer John Hege, 41, both motorcycle officers, were shot following a traffic stop in East Oakland. Just over two hours later, SWAT team members, responding to an anonymous tip, tracked the gunman to an apartment building just a few blocks from the original shooting scene. As they entered a bedroom, the gunman opened fire through a closet, striking Sergeant Ervin Romans, 43, and Sergeant Dan Sakai, 35. Another member of the SWAT team, though injured himself by gunfire, managed to shoot and kill the suspect, a parolee who had been convicted of assault with a deadly weapon and was also wanted on a no-bail warrant. Saturday’s deadly shootings come at a time when law enforcement officer fatalities in general—and officer deaths involving firearms specifically—are on the decline. According to NLEOMF records, 133 officers died in the line of duty in 2008, a 27 percent decrease from the prior year and the lowest annual total since 1960. Last year, 39 officers were killed in firearms-related incidents, a decrease of 43 percent from 2007 and the lowest number since 1956. NLEOMF officials credit increased awareness of officer safety and improved policies, training and equipment—in particular, continued improvements in soft body armor—for the dramatic decline in firearms-related fatalities over the past three decades. But Saturday’s incidents demonstrate that even with safety measures in place, officers face tremendous risks from criminals armed with high-powered weapons. This was the first multiple-fatality shooting incident of U.S. law enforcement officers in over a year. On February 7, 2008, Officer Thomas Ballman and Sergeant William Biggs Jr., of the Kirkwood (MO) Police Department, were shot and killed by a gunman who had gone on a rampage at the city hall. The last time more than two officers were killed in a single firearms-related incident was September 8, 2007, when Odessa (TX) Police Corporals John Gardner, Arlie Jones and Abel Marquez were gunned down while responding to a domestic disturbance call. The last time four officers were gunned down in a single incident was February 28, 1993. Four Special Agents of the U.S. Bureau of Alcohol, Tobacco and Firearms (ATF) were killed attempting to execute a search warrant at the Branch Davidian compound in Waco, Texas: Conway LeBleu, Todd McKeehan, Robert J. Williams and Steven Willis. One of the most infamous, multiple-fatality shootings occurred almost 40 years ago in Los Angeles County, CA. On April 6, 1970, Four California Highway Patrolmen—George Alleyn, Walt Frago, Roger Gore and James Pence—died in an intense, four-minute gun battle with two heavily-armed suspects. The Newhall Incident, as it became known, reverberated throughout the law enforcement community and led to major reforms in training procedures, firearms use and arrest techniques. The NLEOMF extends its sympathies to the families of the fallen Oakland PD heroes, their co-workers and the entire Oakland community. The Memorial Fund will be there for them during the immediate aftermath of this tragedy, and the officers’ service and sacrifice will always be remembered. 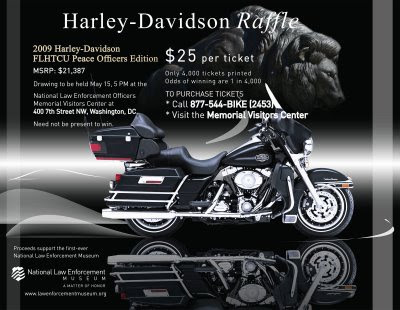 Harley Raffle Tickets On Sale! Ticket price: $25 each; only 4,000 tickets will be sold! Another motorcycle donated by Harley-Davidson is up for raffle in time for National Police Week 2009--and this bike is special. This Police Officers Edition of the Harley-Davidson FLHTCU has a "thin blue line" edging the body design and other unique features. Tickets are just $25 each, and only 4,000 tickets will be sold. That means we may not even make it to National Police Week (May 10-16) before we sell out. Get your tickets today. The drawing will be held May 15, 2009, at 5 PM at the Memorial Visitors Center & Store. You do not need to be present to win. For more information, including a downloadable copy of the raffle poster than you can display, visit www.nleomf.org/Harley09. All proceeds from the sale of raffle tickets go to the Matter of Honor Campaign to build the first-ever National Law Enforcement Museum. Do your part today to support the Museum. Who knows? You may be the one to ride away on a brand new Harley-Davidson. MSRP excludes all taxes title/documentary fees, registration, tags, Harley-Davidson prep, labor and installation charges, insurance, optional equipment and accessories, certificate of compliance or non-compliance fees, and finance charges. Delivery must be coordinated through Rockville Harley-Davidson by June 30, 2009. 4,000 tickets printed. Odds of winning are 1:4,000. Ticket holder need not be present to win. Licensed by the D.C. Lottery and Charitable Games Control Board. Must be 18 years or older to win. No substitutes, return for cash, or other models. As per IRS tax code, amounts paid for chances in a raffle do not qualify as a deductible charitable contribution. Taxes on prizes are the responsibility of the winner. Engraving the names onto the Memorial is a process that starts long before Engraving Day in April and the Candlelight Vigil in May. There are records to collect, reports to read, and an intricate process of review and approval, spell checks and placement checks that make up many months of activities for the NLEOMF's Research Department. With about two months to go until National Police Week, the Research Department made it to a crucial point for this year's names engraving - they tested the proof of the names by laying them out on the Memorial walls, and made final changes to the placement. As Ms. Bernie Spence, Director of Research, led her team to the Memorial on E Street, the sun was bright and all remnants of the winter storm that hit the East Coast just four days previously were nowhere in sight. It was a beautiful, peaceful day that somehow fit perfectly the seriousness with which they took on their project. Research team members Carolie Heyliger, Jeremy Borrego and Jackie Piccigallo placed the names and arranged them until they fit perfectly, as Bernie took careful record of any changes they made. "It's a very important and detailed process," Bernie said. "We collect names and data forms on officer deaths as they occur throughout the year, and look for historical deaths that we may have missed. We gather support documentation such as medical records, newspaper articles and official reports, and review it all with the Memorial Fund's Names Committee for final approvals." After several meetings with the Names Committee, Bernie said, they finalize a completed list of the names that will be engraved and honored during National Police Week, and from there they double and triple check spellings and placement on the walls. "Once we carve an officer's name in stone, we can never change it, so we want to make sure we get everything exactly right," Bernie said. "It's important to us that we give this gift to the officers' loved ones. It's a gift of history and remembrance - a gift that will last forever." Senior Corporal Norman Smith of the Dallas Police Department was gunned down on January 6 as he and fellow members of the Gang Unit went to a known drug hangout to serve an arrest warrant for aggravated assault. In the aftermath of the tragedy, the Police Department is implementing new policies designed to enhance officer safety during these types of high-risk situations, the Dallas Morning News reports. The new policy sharply limits the number of officers who can serve arrest warrants on suspects considered dangerous. These officers are required to undergo specialized, ongoing training and to wear bullet-proof vests when executing a felony warrants. The new rules also require that officers knock and announce that they are police. The moves were generally praised by both law enforcement training experts and police association leaders. “It’s a smart move to have a protocol in place,” Ed Nowicki, executive director of the International Law Enforcement Educators and Trainers Association, told the paper. “Nobody wants to see an officer lose his life in the line of duty, but his death would be even more for naught if something didn’t change,” he added. The NLEOMF joins Americans everywhere in mourning the loss of Paul Harvey. The beloved ABC News radio broadcaster died on February 28, surrounded by family members in Phoenix. He was 90 years old. A longtime friend of the Memorial Fund, Mr. Harvey understood the significance of the nation’s monument to fallen law enforcement officers in a deeply personal way. That was because of his father, Tulsa (OK) Police Officer Harry Aurandt. On December 19, 1921—in the midst of a crime spree that had all of Tulsa’s officers on the lookout—Officer Aurandt and Tulsa’s chief detective, Ike Wilkinson, were driving on a road five miles from the city when they spotted a suspicious vehicle and stopped to investigate. Without warning, they were ambushed by four desperadoes, all with criminal records and all out on bond. Although Harry raised his arms as he was directed to do by the bandits, they shot him anyway, one bullet piercing his liver, another his lung. Detective Wilkinson fired back, but he was also seriously wounded. Despite his critical injuries, Harry held courageously to the wheel of the car and managed to drive himself and Ike to a farm house about a mile away. Ike Wilkinson survived the shooting, but permanently lost the use of his legs. Harry Aurandt, at the age of 48, was not so lucky. He died the day after the attack with his wife, Anna, by his side. Son Paul was just 3 years old. Eleven years later, at the age of 14, Paul got his first radio job, at KVOO in Tulsa. He enlisted in the U.S. Army Air Forces in 1943 and received an honorable medical discharge a few months later after a training injury. After his military service, Paul Harvey Aurandt shortened his name to Paul Harvey and moved to Chicago, where he began doing his twice-daily, 15-minute news commentaries. In 1976, Mr. Harvey began a five-minute daily broadcast called “The Rest of the Story,” which became his signature tagline. In recent years, his “Paul Harvey News and Comment” program attracted 22 million listeners daily. Even with great fame and popularity—he was a runner-up in the 1969 Gallup Poll of the most admired man in America—Paul Harvey never forgot his Midwestern roots … or his father’s sacrifice. He supported many of the Memorial Fund’s efforts over the years, and he was a featured speaker at the 1992 Candlelight Vigil at the freshly dedicated Memorial in Washington, DC. A clip of his remarks can be found on the NLEOMF You Tube channel. Mr. Harvey’s wife, Lynne Cooper Harvey, died in 2008. He is survived by son Paul. Rest in peace, friend.